Boggy areas and acidic wet meadows with cranberry in many parts of our state provide critical habitat for the diminutive Bog Copper. It is a very local butterfly. While it can reach high concentrations in the bog where it reproduces, prompting some dispersal along streams or into open wet meadows, it is not a strong flier and does not colonize new areas quickly (Cech, 2005; NatureServe 2010; Scudder 1889: 988). In Massachusetts, as elsewhere, there is much seemingly suitable habitat in which it is not found. Therefore the focus in this case should be on protecting the butterfly directly, not simply on conserving likely habitat. Bog Copper undoubtedly decreased in eastern Massachusetts between 1900 and 2000, as industrial and suburban development obliterated many bogs and wet meadows (Table 2). 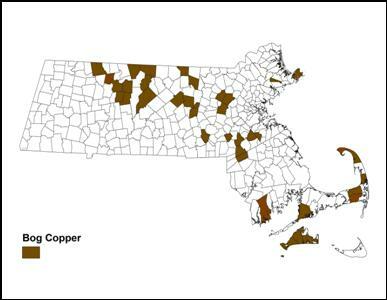 Scudder reports Bog Copper from many eastern Massachusetts locations where it cannot be found today. He lists specimens from “Andover (Sanborn, Clapp), "the great meadows between Belmont and Lexington," “abundant” (Thaxter), Malden “hundreds” (F. H. Sprague), Newton (Faxon, Minot), West Roxbury (Faxon), Cambridge and Milton (Harris) and Walpole (Guild) (1889: 988).” It is not found in any of these towns except Walpole today. Museum specimens underscore Bog Copper’s robust presence in eastern Massachusetts from the 1880's through the 1930's, and highlight it's loss from that region today. From the large but now-extinct Malden colony, F. H. Sprague collected about 36 specimens between July 13 and 21, 1883; these are now preserved in the Harvard MCZ. Sprague also mentions finding the species in Wollaston (now Quincy) (and in Belchertown: Sprague 1878). From those “great meadows between Belmont and Lexington” Charles Bullard collected ten specimens July 18 through 24, 1897. From Newtonville, there is an 1888 specimen in the C. J. Paine collection. There are no reports from any of these towns---Malden, Wollaston, Belmont, Lexington, Arlington or Newton--- today. They are all heavily built-up suburbs. Milton, where Thaddeus Harris lived for many years, was another well-known Bog Copper site at the turn of the century. Harris had male and female specimens, found on August 1, 1833 in Milton (Index; Harris Collection MCZ); these appear to be the earliest ever collected in Massachusetts There are Milton specimens from 1899, 1900, and 1902 (H. H. Newcomb) at the American Museum of Natural History (AMNH), Boston University, and the Smithsonian Institution. C. L. and P. S. Remington collected two specimens at “Milton Blue Hills” in 1936; these are now at Yale Peabody Museum. Today some habitat in Milton is preserved as the Great Blue Hills Reservation, including Fowl Meadow Reservation, but there are no reports of Bog Copper from these areas. Milton is surrounded by the towns of Randolph, Canton, Norwood, Westwood, Dedham, and Needham; Canton/Randolph hosts the important Ponkapoag Bog. H. Clench found Bog Copper in Norwood in 1941 and 1942 (McGuire; AMNH; Smithsonian), W. P. Rogers found it in Dedham in 1941 (Yale), and W. Winter found it in Westwood in the mid-1970's (MCZ). But Bog Copper has not been found in these towns recently; there were reports from Ponkapoag Bog in 2003 (B. Cassie and T. Murray), but none seen since despite many visits. And it is highly unlikely that Bog Copper could be found in Westwood today, due to housing development and re-growth of woodlands (E. Nielsen, pers. com. 12/22/2011). Further west are Dover, Sherborn, and Framingham, again towns where Bog Copper is not found today. In the 1970’s, Bog Copper was documented in Dover by J. S. Ingraham (specimens at Yale) and William D. Winter (specimens in MCZ). There are turn-of-the-century Bog Copper specimens from Sherborn (E.J. Smith, A.P. Morse, BU). C. J. Frost collected Bog Copper in Framingham (South Framingham) between 1901 and 1907; many specimens are in the MCZ and at Boston University. However, Bog Copper is still found today in a few towns in "metro-west," primarily Sudbury, Concord and Acton. In the 1960’s Bog Copper was actively collected in the towns of Acton and Littleton by C. G. Oliver (many specimens now at Yale), and was found in Carlisle 18 July 1973 by E. Peters (LSSS 1973). North of Boston on Cape Ann, a colony in Gloucester, perhaps in the area now called Dogtown, was known by 1896. F. H. Sprague collected six specimens there July 4, 1896; these are still extant and in good condition in the Harvard MCZ. W. T. M Forbes collected there again in 1931 and 1939; specimens are at Cornell. This colony may or may not still be in existence; but there is a small, better-known colony today in Rockport. Also north of Boston, C. V. Blackburn collected Bog Copper in Stoneham –probably in what is now Middlesex Fells— on July 23, 1933 (AMNH; Furman U.). A. H. Clark found it in Essex in 1924 or 1925 (Clark 1925). It was in Tyngsboro in 1915 (MCZ), and W. Winter found it in nearby Dunstable in the mid-1970's (MCZ). There are no recent records from any of these towns, even from Middlesex Fells despite many visits by butterfly watchers. South of Boston, specimens from the huge and wonderful Hockamock Swamp in the towns of Raynham, Taunton, Norton, Easton, Bridgewater, and West Bridgewater date from 1932. Many collectors documented Bog Copper there in the 1930's: there are specimens from E.T Learned at AMNH, C.L. and P.S. Remington at Yale, D. J. Lennox at UNH, and others at the Smithsonian and the McGuire Center. There are no current MBC or Atlas records from this area, but it has not been visited recently. The earliest evidence of Bog Copper on Cape Cod comes from Woods Hole: ten specimens collected there by W.T.M. Forbes on July 13, 1919 (Cornell U.; AMNH). (There are many 1891 specimens from "Chatham Harbor" in the A. G. Weeks Collection at Harvard MCZ, but it is unclear if these are from Massachusetts or New Jersey.) There are 1924 specimens from Brewster, Mass. in the MCZ and 1926 specimens from Marion, Mass. in the Smithsonian. Bog Copper is found today in several Cape Cod towns. Bog Copper is first mentioned for Martha’s Vineyard and Nantucket in 1920, and is well documented in the 1930’s and 1940’s by F. M. Jones and C. P. Kimball, (specimens at Yale; Jones and Kimball 1943). On both islands, it was "very common in cranberry bogs" (Jones and Kimball 1943). Nantucket specimens from 1926-1928, probably collected by C. W. Johnson, are at Boston University, and from 1938, C. P. Kimball, in the Maria Mitchell Museum on the island. Bog Copper remains common on the Vineyard today, but may be gone from Nantucket (see below). Scudder (1899) reports Bog Copper absent from west of the Connecticut River valley. This is still the case today according to recent MBC records (see map below). Scudder and other early lepidopterists were not familiar with Bog Copper’s host plant or early life stages. These were finally described in great detail in the 1980s (Wright, 1983). The sole host plant is cranberry; usually Large Cranberry (Vaccinium macrocarpon), but also Small Cranberry (V. oxycoccos), both of which are common in Massachusetts. Beyond these, this species has not adopted any new host plants so far as is known and is not among the "Switchers." Bog Coppers can survive only in un-worked cranberry bogs; commercial bogs do not support it, because of heavy insecticide use and mechanical disturbance. Many habitat occurrences have probably been lost due to the development of cranberry farming, especially in Plymouth County, although specimen evidence is lacking. Boggy areas and acidic wet meadows with cranberry are the prime habitat. Observers have found several sizable colonies in acidic wet meadows, at times associated with alluvial soils of river flood plains, as well as in bogs. Any acidic, open, sunny, and year-round wet situation, which is infrequently mowed, can probably act as habitat and/or dispersal corridor if cranberry is present. Cranberry is sometimes found on drier soils, but Bog Coppers do not utilize these habitats. Bog Copper eggs are laid on the underside of the cranberry leaf close to the surface of the bog, where they overwinter, surviving the ice and periodic inundations. The larvae emerge in spring and eat the cranberry leaves; cranberry is also used for nectar by adults. There is a single flight period in late June through July. Mating occurs shortly after emergence. The 1986-90 Audubon Atlas found Bog Copper in 26 of the 723 blocks surveyed, making it “Uncommon.” MBC sightings data rank the species as Uncommon to Common (Table 5). There can be high concentrations within a local habitat, but bog habitat itself is not common. The statewide result in Chart 16 also depends greatly on the reports from one NABA Count, Central Franklin. Over the years of that long-running count, the areas actually visited have increased, and more and more bog habitats have been found, which partly accounts for the increasing numbers reported (M. Fairbrother, NABA count reports). Bog Copper has been found on this count every year since 1990, with numbers ranging from lows of 9 (1991) and 25 (1999) to a high of 781 (1995) in the 1990s, and from 102 (2000) to 1509 (2008) in the 2000’s. Raw numbers adjusted for total party-hours in count years 1990-2010 reveal peaks in 1995 and 1996, then low readings 1997-2000, and another set of peak readings in 2005-2008, with declines 2009-2013. This pattern may reflect fluctuations in populations in that count area. It also generally accords with the pattern shown in Chart 16. For 2007, 2008, and 2009, the average number of Bog Coppers per report of that species statewide increased 196%, 211%, and 53% respectively, relative to the average for preceding years back to 1994. The number of reports of this species, and the maximum number reported, also increased in 2007 and 2009 relative to prior years. (Nielsen, Season Summary, MB 2008-2010, Nos. 30, 32, 34). These calculations show a similar picture to Chart 16 for 2007 and 2008. Many generalized range maps show the whole of Massachusetts as within the range of the Bog Copper (e.g. Cech and Tudor 2005; Opler and Krizek 1984). But that is not the case, as Map 16 demonstrates. There are no MBC reports from any towns in Berkshire County, and no reports from the Central, Southern or Northern Berkshire NABA Counts 1992-2013. Nor did the 1986-90 Audubon Atlas find Bog Copper in Berkshire County except for one specimen from Otis (E. Neumuth 7/23/1989). A search of the voluminous museum specimens available yields no older records for this county. Similarly, neither the Atlas nor MBC has any records for the southern Connecticut River valley, or for areas south of the Quabbin Reservoir, or for most of southern Worcester County. The Blackstone Valley NABA Count reports between 1 and 3 Bog Coppers in the town of Upton in 2007-2009, but none before or after those years. Both Atlas and MBC records attest to Bog Copper’s abundance in Franklin County, which is perhaps its greatest stronghold today. Bog Copper has been reported on the Central Franklin NABA Count every year since its inception in 1990. Productive areas are found in Colrain, Leverett, Shutesbury, Warwick and Wendell. Historically, Bog Copper seems to have been first reported for Montague in 1976 by Deane Bowers (LepSocSeasSum, 1976), and was subsequently collected in Wendell State Forest on July 7, 1985 by R. G. Webster (McGuire). In addition to Franklin County, northern Worcester County is home to many Bog Coppers. The species was reported every year since 1996 on the Northern Worcester County NABA counts, usually in double digits, with a high of 181 in 7/7/2002, however none were reported in 2012 or 2013. Some of the highest numbers reported per trip have come from Athol Reservoir, and Tully Dam and Tully Lake in Royalston (for example, 125 at Tully Lake 7/13/2003, C. Kamp and D. Small). Wachusett Reservoir in Clinton/Sterling has been another important site in Worcester County, but there are no reports since 2009. Older museum specimens come from Dunstable and Ashburnham. Towns to the southwest of Boston, such as Mansfield, Walpole and Millis, probably still host Bog Coppers, as they did historically, although most reports are from the 1990's and recent counts are lacking. Bog Coppers from Mansfield were reported on the Foxboro NABA Count each year 1992-1997. Suburbs to the west, such as Sudbury and Acton, also still report Bog Copper, at least through the 1990's and early 2000's. Good numbers were reported from Sudbury and Acton in the 1990s. Bog Copper was reported almost every year 1990 - 2009 on the Concord NABA Count (which includes parts of Sudbury and Acton), with numbers varying from 2 to 86, but only 5 were reported in 2009 and none at all in 2010, 2011, 2012, or 2013. There are no recent records for most of southeastern Massachusetts (Plymouth and Bristol Counties), probably owing to commercial cranberry farming. The last report from lower Bristol County was of one individual, 1996, Bristol County NABA Count. There are two earlier Atlas-era reports, one from New Bedford and one from north Dartmouth. The town of Dartmouth is shown on Map 16, but Bog Copper may well be gone from the southern coastal area. Targeted searches should be made. In Essex County today, only two small colonies of Bog Copper are known: one in Rockport (max. 44 on June 26, 2001, F. Goodwin; recent max. 30 on July 1, 2011, M. Arey), and one at Cedar Pond Bog in Wenham, a MassAudubon property (max about 10). The Rockport colony has been visited consistently for many years to determine flight dates. The 1986-90 Atlas had reported Bog Copper from Newburyport, possibly from Parker River National Wildlife Refuge on Plum Island, but no subsequent reports from the Refuge, either from MBC or from refuge biologists, include Bog Copper. The most recent report from Gloucester is 1998; more searches are needed there. Historically, between 1900 and 1934, Bog Copper was reported from Boxford (D. W. Farquhar, 1930’s), Essex (A. H. Clark, 1924-5), and nearby Stoneham (23 July 1933, C. V. Blackburn, AMNH; Farquhar 1934); but MBC has no reports today from Boxford, Essex or Stoneham (Middlesex Fells). In Andover, Bog Copper does not appear to be present today. Scudder had reported the species there a century ago, and Robert Godefroi collected four specimens in the 1980s (July 4, 1984; July 7, 1985; July 7, 1987; and July 1, 1988; McGuire Center), which were not reported by the MAS Atlas. Reportedly, he found these in a small wetland which is today the site of the Orchard Crossing housing development, and Bog Copper is no longer there despite searches. Oddly, Bog Copper has not been found in the well-known Andover bog at Ward Reservation TTOR (H. Hoople, pers. com. 11/13/2011, 12/18/2011). Bog Copper is common on Cape Cod, as indicated by both MBC and Atlas records. It is reported from Falmouth, Brewster, Eastham (old bog, 6/22/2013, M Faherty), Truro, and Provincetown. Tor Hansen reports it from Hatches Harbor and Evans Field in Provincetown, e.g. 8 on 7/13/2013. And for the first time in 2013, J. Dwelly reports it from the Bank St. Bog in Harwich, a former commercial cranberry bog now a conservation area, to which Bog Copper has happily returned. 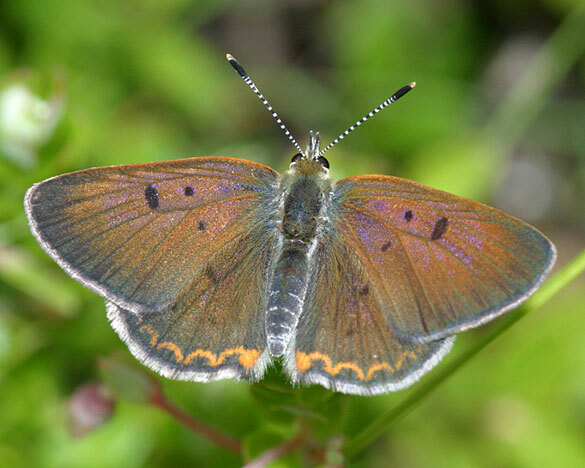 Mello and Hansen (2004: 35) agree that Bog Coppers are "common and widespread throughout the acid wetlands of Cape Cod;” they note that in the Provincelands, the butterfly may be found in the wet depressions between sand dunes. For Martha’s Vineyard, there were no 1986-90 Atlas reports, but since 1990 many MBC reports have come in, and the Vineyard checklist rates Bog Copper as “common” (Pelikan 2002). It is usually reported on the yearly Vineyard NABA Counts. Edgartown and Tisbury have perhaps the best areas on the Vineyard for Bog Copper. Historical specimens from Martha’s Vineyard are in the MCZ (C. P. Kimball, 20 July1928) and at Yale (W. P. Rogers, 2 July and 23 July, 1941, and F. M. Jones 10 July 1941 and other dates). Bog Copper was reported as “sometimes abundant in cranberry bogs” on the Vineyard by Jones and Kimball (1943). It is possible that Bog Copper is gone from Nantucket, like the Silver-bordered Fritillary (LoPresti, 2011). The Atlas did have a report from Nantucket (W. Maple, 7/17/1987), but since then there have been NO reports from that island, and further searches are needed. There are many historical specimens, however: from 1926-1928 at Boston University, and from 1 Jul-1938 C. P. Kimball, at the Maria Mitchell Museum. Sixty years ago, Jones and Kimball (1943) reported Bog Copper as “very common in cranberry bogs” on the island. Bog Copper is a univoltine species, flying mainly from the last week in June to the end of July. The largest numbers are seen during the first two weeks of July (http://www.naba.org/chapters/nabambc/flight-dates-chart.asp). Over a century ago, Scudder (1889:989) wrote that the earliest Bog Coppers appeared “the last of June---about the 25th.” He may have been including localities further north than Boston, however. Whatever the reason, this date is similar to the majority of Massachusetts reports today. He also wrote that they “become abundant during the first week in July,” a timing again similar to that of today. In one small monitored colony in Rockport on Cape Ann, the site was visited frequently around the beginning and the end of the flight period for many years by D. Savich and C. Tibbits. Between 1996 and 2009, the earliest flight dates for this colony were 6/25/2001 (33 flying), 6/27/2008, and 6/28 in 2000, 2002, 2004 and 2007. The latest sightings, often with only one individual flying, were 7/21/1996, 7/19/2003, and 7/18/1998. In Connecticut and Rhode Island, the conservation status of the Bog Copper is a concern: its rank in Rhode Island is S3 or “vulnerable,” while in Connecticut it is S2 or “imperiled,” and a state species of Special Concern (NatureServe, 2010). The 1995-9 Connecticut Atlas reported some probable decline, due to restricted habitat and succession in cranberry bogs. In New Jersey, although the status is S4, management to avert plant succession in cranberry bogs has been strongly recommended (Gochfeld and Burger 1997:147). Ohio and Indiana stand as warnings of what can happen where cranberry bogs are unprotected. Bog Copper is presumed extirpated in both states; it has not been reported in Ohio since the 19th century, despite searches, and the cranberry bogs which were once widespread throughout northern and central Ohio have been largely destroyed through draining or flooding (Iftner et al. 1992). Conservation of the Bog Copper should be a priority in Massachusetts. We list it here as a Species of Conservation Concern. The many examples above of colonies lost in eastern Massachusetts ---from Andover, to Westwood, to Nantucket ---point to the need to protect remaining colonies. The NatureServe (2010) status of Bog Copper here is S4 or “apparently secure” at present, and state wetland protection laws seem reasonably strong. But conservation of the bog habitat does not guarantee that the butterfly will be present, since dispersal ability is weak and dense forest probably acts as a barrier (NatureServe 2010). Existing small isolated colonies of Bog Copper are vulnerable. In addition, this species is probably vulnerable to climate warming (Table 6), since its present range does not extend south of New Jersey or Wisconsin.